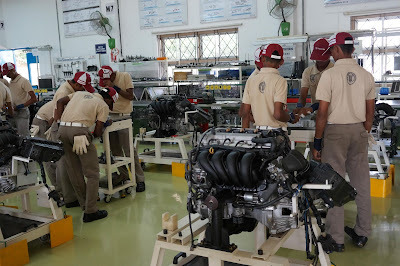 Toyota Kirloskar Motor (TKM) has announced the opening of admissions for the academic year 2018-19 of Toyota Technical Training Institute (TTTI), a dedicated 3-year program that provides opportunities for intelligent students from economically weaker sections across Karnataka to become skilled technicians in auto manufacturing and plant administration. Sharing his experiences, Lokesh - TTTI Student, said, “The training and the best practices shared at TTTI has been excellent & it has transformed me to become an industry-ready employable citizen. I witnessed an overall personality development in self including physical fitness, communication skills, technical know-hows & manufacturing skills. As a part of the TTTI curriculum, the on-job training in the shop floor has given me an insight of the real-working experiences, to develop as an ideal employee. I thank TOYOTA for giving me this wonderful opportunity”. Admission to the 12th batch of TTTI is open to male candidates only (at present) from economically backward sections of the society, from across the state of Karnataka. Aspirants between the age of 15-17 years (as on 15th July 2018) and have cleared SSLC in their first attempt with 50% overall and 50% in Mathematics and Science each are eligible to apply. Note: Those who have completed or holding only other formal Degree/ Diploma/ ITI certificates are not eligible to apply. The selection procedure which starts soon after the SSLC result announcement (during May ’18) includes a written test, skill test, physical test, assessment test, interview, medical test and antecedent check. The three year full-term apprentice residential training in Automobile Manufacturing has four courses namely Automobile Assembly, Automobile Weld, Automobile Paint and Mechatronics. Toyota Kirloskar Motor has been instrumental in promoting skill development in the automotive industry through various innovative programs. TTTI is one such step by the company towards helping talented youth from rural Karnataka in improving their quality of life and making them more employable thereby promoting a robust economy in the country. The institute has provided training to close to 530 students from across the state. v TTTI student secured 3rd position (Bronze Medal) in Prototype Modelling & Medallion of Excellence in Mechatronics in World Skill Competition 2017 held at Abu Dhabi.